Pixel Tactics is a head-to-head game of tactical combat for two players. Each player has an identical deck of 25 cards, from which they draft a leader. The leader's abilities alter vastly the strategy and playability of every other card in the deck, making the game playable in 25 different ways. In the game, players take turns placing cards and attacking. Each card can activate in various ways, taking on offensive capabilities in the front rows of the unit, or support powers in the back rows. Cards can also be played as orders – powerful single-time effects that can turn the tide of battle. Play continues until either player's leader is defeated. A typical game is best of three or five rounds. Pixel Tactics 5 takes place in the same world and uses many of the characters from Level 99 Games' BattleCON: War of Indines, but its gameplay is entirely unrelated. 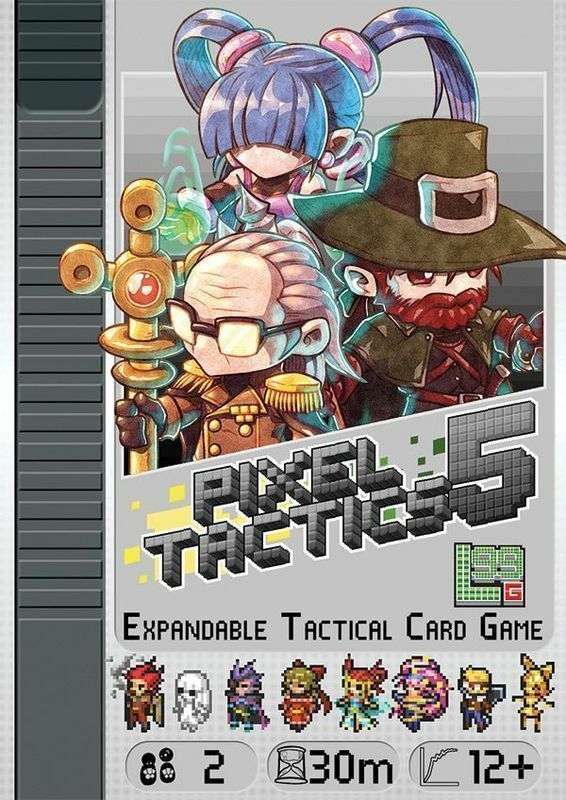 This iteration of Pixel Tactics was originally planned to be released as the following Pixel Tactics Deluxe kickstarter promos: Pixel Tactics Black Ops Minipak Pixel Tactics: Sealed Secrets Minipak Pixel Tactics: The Final Frontier Minipak For ease of distribution these were combined to make Pixel Tactics 5.